(York, Pa., Feb. 23, 2017) - The York Revolution have announced three more signings for the 2017 season, bringing back standout catcher Isaias Tejeda, while adding infielder Ryan Dent and left-handed pitcher Jarret Martin. The signings were announced by Revs manager Mark Mason Wednesday evening on “Revs Hot Stove Weekly presented by Shipley Energy” on SportsRadio 1350 WOYK. Tejeda returns after a spectacular 2016 campaign spanning 65 games over two stints with York that saw him post a .356 average which would have led the league with enough plate appearances. 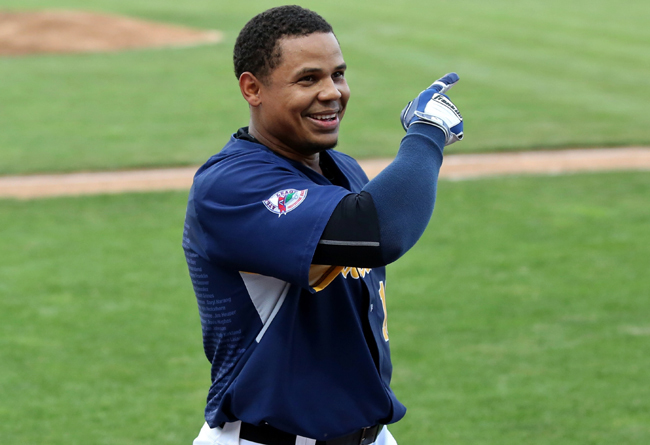 Tejeda added nine home runs, 23 doubles, 38 RBI and 32 multi-hit games and enjoyed a 28-game hitting streak (May 30-September 2) spanning his two stints. The streak was the second longest in club history and just three games shy of Chris Ashby’s league-record 31-game streak in 2008. Tejeda spent nearly two months in the Atlanta Braves organization after having his contract purchased on June 21. Prior to York, the 25-year-old spent six seasons in the New York Yankees organization. The Dominican Republic native enters his eighth pro season in 2017. Dent brings 10 years of pro experience, including eight years in the Boston Red Sox organization and two more with the Chicago Cubs, reaching the Triple-A level with both clubs. Just 27 years old, the versatile infielder was a first round selection (62nd overall) of the Red Sox in the 2007 amateur draft and is a career .230 hitter with 36 home runs, 251 RBI, and 91 stolen bases. The Long Beach, CA, native was named the Red Sox Minor League Defensive Player of the Year in his third pro season in 2009. Martin has pitched in the Baltimore Orioles, Los Angeles Dodgers, and Milwaukee Brewers organizations during the course of his seven pro seasons, reaching the Double-A level with the Dodgers in 2013-14. Martin was a Midwest League All-Star as a starter in 2012 and, as a reliever over two seasons at Double-A, combined to post a 3.03 ERA in 57 outings for Chattanooga, earning a spot on the Dodgers 40-man roster. The 27-year-old was an 18th round draft pick of the Orioles out of his hometown Bakersfield (CA) College in 2009. The Revs now have nine players signed for the upcoming season and will continue to unveil preseason signings live each week on “Revs Hot Stove Weekly presented by Shipley Energy”, with the next episode set to air on Tuesday, February 28, at 6:30 p.m. immediately following “The Baltimore Baseball Show” on SportsRadio 1350 WOYK.